Character no longer slips and slides around walls in confined spaces. The new controller is more responsive, should feel better when moving around in precarious situations like building the walls and roofs of buildings. Character climbs stairs without requiring jumping. Character no longer slides off of steep slopes, like roofs. Added a Controls popup that tells you how to interact with things in the world when you look at them for 1 second. Shows what each mouse button and ‘E’ key do. Added initial support for playing on local worlds. Note: Initially this is a PC only feature, we will be looking at adding support for this on OSX and Linux in the future. You can create and load worlds locally, and play without needing to setup your own server - it does most of the legwork for you. Added a ‘Continue’ option, which will remember the last server you joined or world you loaded. One click gets you back into the game! Player avatars now have more accurate foot placement and new animations including running, jumping and swimming. Improved the end game win sequence. Changed the way the Laser works: it now destroys the meteor 30 seconds after activating. Since this removes the 9 hour charging time, it instead requires double power. Made the meteor easier to spot, fixed issues where the meteor was impossible to see. Changed the units of the AirPollutionSource and AirPollutionSpread world layers from tons of pollution per 16 square meters to tons of pollution per square meter. Made /help sort and categorize the displayed chat commands. Fixes a lot of issues when holding logs with shovel, or rubble with pickaxe, etc. Fixes some items not appearing in store selection window, including coal and certain seeds. 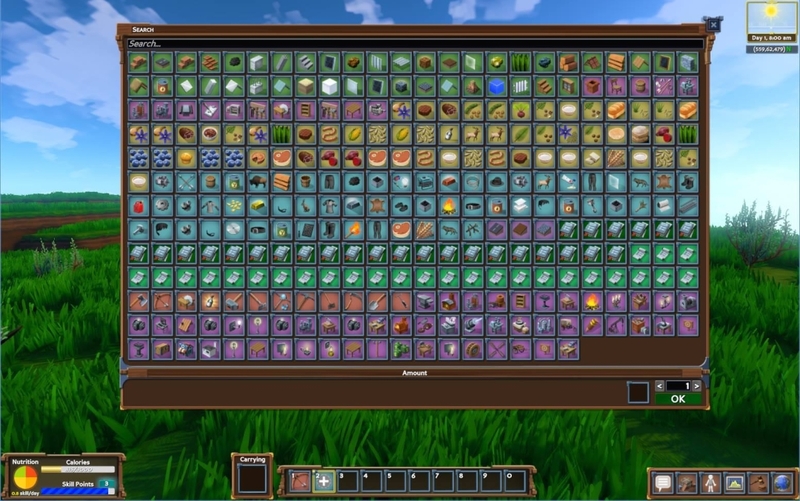 If world layers changed dirt in stockpiles to other types, such as grass or desert sand, the stockpile used to lose the dirt item associated with it. Fixes that. Fixed not being able to walk after opening the advanced settings in the escape menu. The Eco Steam date is official: February 6th! We’ll be launching our Beta version in Early Access. Until then, all purchasers past-and-present will get these alpha rewards, a Meteor Shard and a Top Hat and Goggles, as a way to say thanks for your support all these years! If you are reading this on the forum, there's a good chance you are already an Alpha backer. Thank you from the bottom of our hearts We couldn’t have made it this far without you. Once we release on Steam these rewards will no longer be available to new players, and we will be dropping the price from $40 to $30 (Any accounts or invites purchased before then will retain the rewards). Also just released 6.3! Check out the feature list here. 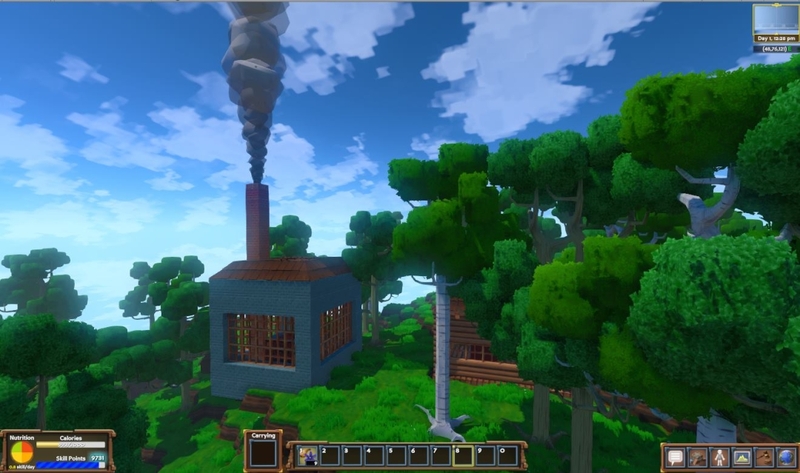 Eco Alpha 5 Released. New climate change model and lots more. We’ve left Alpha 5 in the oven a bit longer to get it more polished, and today it’s ready to be released! Check it out at strangeloopgames.com/eco, where you can pick up the alpha version and give it a try. New climate and ecosystem model, tracking ground and air pollution, global temperature from CO2 released, sea levels rising, deforestation impacts, biomes that change, dynamic irrigation, and much more. Avatar creation and customization, with clothing as a new item type. 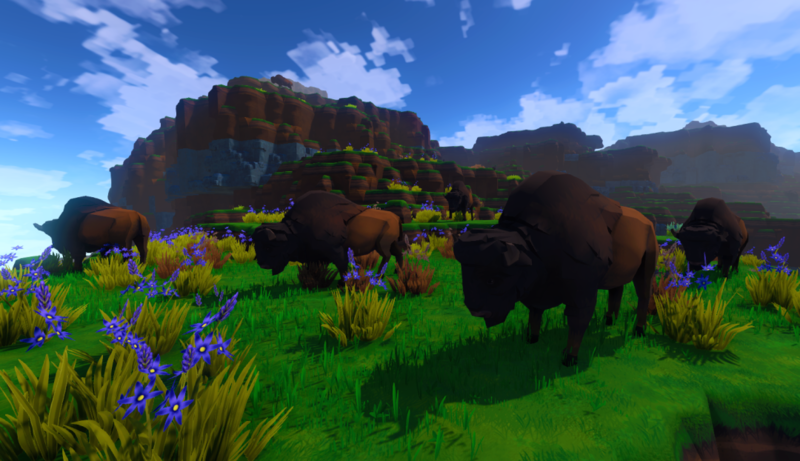 Added turkeys, bison, and foxes to the ecosystems. Power system, both burning fuel for campfires or generating electricity from a generator and power grid. Tons of polish, bug fixes, and other small features. We’re cruising along towards beta, and then the Steam release after that (after which all purchasers will get a free Steam key). We now have a public discord for chatting about Eco and its development. You can join the Eco discord here: https://discord.gg/ge3JDp2. You can also join us in the forums here. Thanks to everyone who has supported us, been amazing seeing the community grow and getting tons of great feedback. Keep it coming, and feel free to email us directly. You can also follow us on Facebook where we will be posting daily updates from the team here. ‘Eco Alpha 5 : Ecosystem Release’ Announced, October 3rd! Following up on our Alpha 4 Economy Release, we’re releasing the last build before beta, Alpha 5, Ecosystem Release. Climate model. Air pollution from human sources will contribute to the C02 content of the atmosphere, raising global temperatures (potentially destroying farms and biomes) and melting ice caps to raise the sea level. Farming model. Plants and animals now rely on temperature and soil moisture, which can be impacted by a number of factors, both natural and man-made. Farming becomes a lot more about planning and irrigating the land and understanding the impact and where crops will grow best. Irrigation model. 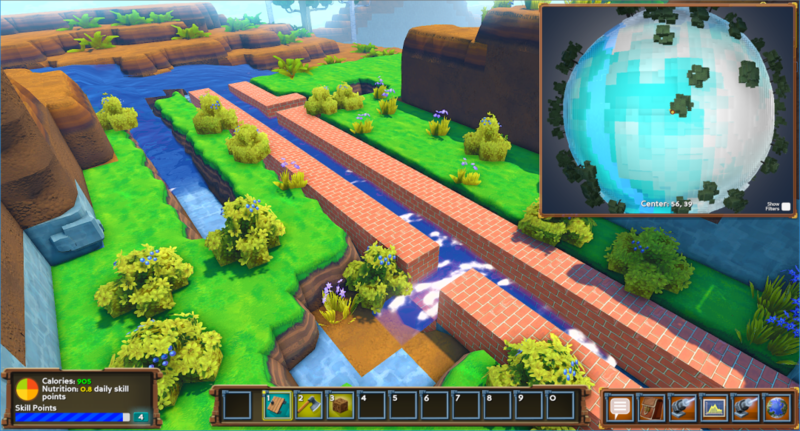 Players can now build aqueducts to transport water over long distances to irrigate crops and supply buildings. This will be key for building the large-scale farms needed to succeed in the game. In the screenshot below you can see how water travels much further in an aqueduct than in an uncontained channel, and the spread of water into the surrounding land that results. World Layers. 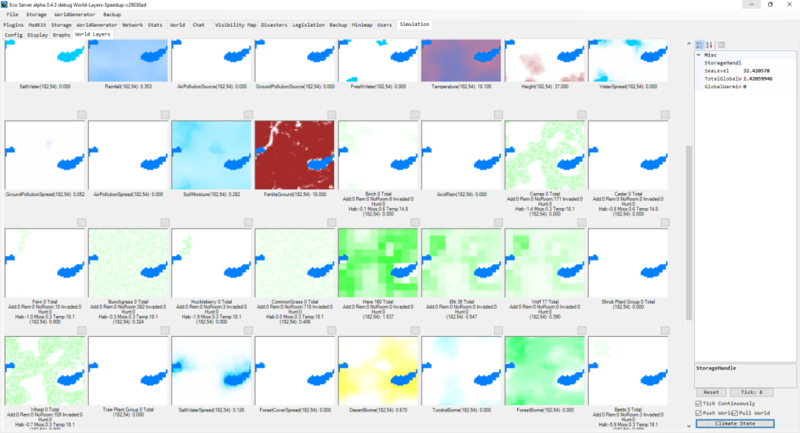 To support these systems and many others we’ve introduced a World layers system, where multiple layers determine values on the surface of the world, changing over time. We’ll be making these accessible to the player so they can view animations of how things like global temperature, animal populations, and pollution change over time and use it in arguments for laws. The image below is the new control panel on the server. New plants and animals. We’re adding a lot more depth to the ecosystem with a new set of plants and animals. Avatars. We’re creating player models and a clothing system which will give boosts to activities. Alpha 4 is for sale now at strangeloopgames.com/eco and all buyers will get Alpha 5 (and all future versions including Steam) free when it comes out. Thanks for supporting us, it was amazing to meet so many people interseted in the game at PAX, and having this kind of support while we complete the game has been extremely encouraging. Lots more to come and we’re excited to hear your feedback as we get there. New Eco Trailer Released! Showing at PAX. We’ve created a new updated trailer for Eco, which we’ll be demoing at PAX! Check it out below. Farming now is really affected by the wider factors that affect the world - climate change can change temperature and rainfall and destroy farms, pollution can make ground infertile, and player-made irrigation can significantly make an area better for farming. There are many other aspects of the game that will be affected by these factors as well. Thanks as always for following us, the game is available now in Alpha here, and all backers will get a Steam key when we launch there. Follow us on Facebook here for updates as well. Thanks and as always let us know any questions. We’re honored to announce that Eco won the grand prize in the Climate Challenge in New York! In Eco players are tasked with building a civilization together in a simulated ecosystem, where they can have a huge impact on the environment and climate. By using scientific evidence and debating with their peers, they can create laws and policy that prevent the world’s destruction. Just like the real world, the challenges faced in Eco are social ones, as players must find ways to sustain a balance between both economy and ecology, neither can be ignored. 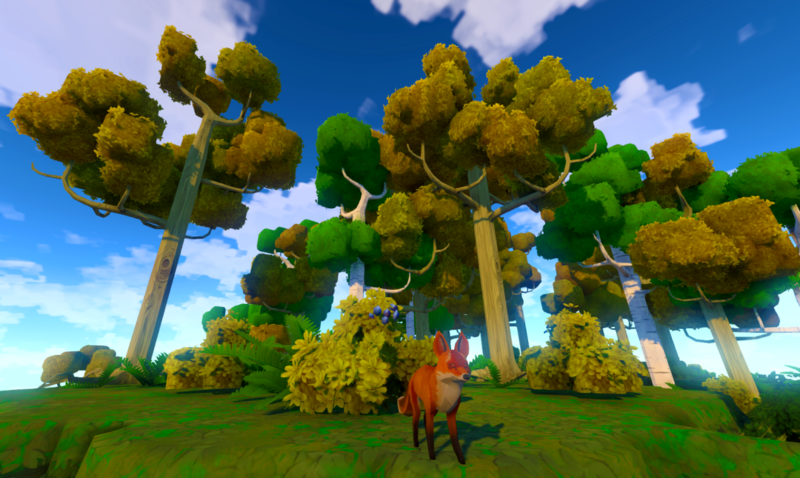 For Eco to be recognized as having the potential to change minds and the world is hugely encouraging and validating, as we believe games have the power to do incredible things beyond only entertainment. We’ve just released our Alpha 4 update to Eco, and you can pick it up here. We’ll have our Alpha 4.2 release next Tuesday 7/19, so stay tuned for tons of fixes. Following that, we’ll be focusing on Alpha 5, which will be the Ecosystem Release and final alpha build before beta. It’ll focus on plants, animals, habitats, pollution, climate modeling, and many more simulation aspects. Join us now and get in on the ground floor to help us shape this game as it continues to grow. Here's a look at our latest video from Alpha 4, transportation and roads. Cheers and as always email with any feedback. Transportation is a huge driver of modifications to the environment, as well as a huge consumer of resources and, in late-game, source of pollution. How players decide to lay out their roads will have a huge impact on the both the ecosystem and economy of Eco. This and many more features available now in our Alpha 4 release! Come join the games in progress or hop on a new server and start from a pristine world. RE: Cant join any server "invalid login token"
You'll need to extract the entire contents of the zip into a folder before trying to run them. Eco Dev Blog 13 - Property, Transport, Landscape, Foliage! 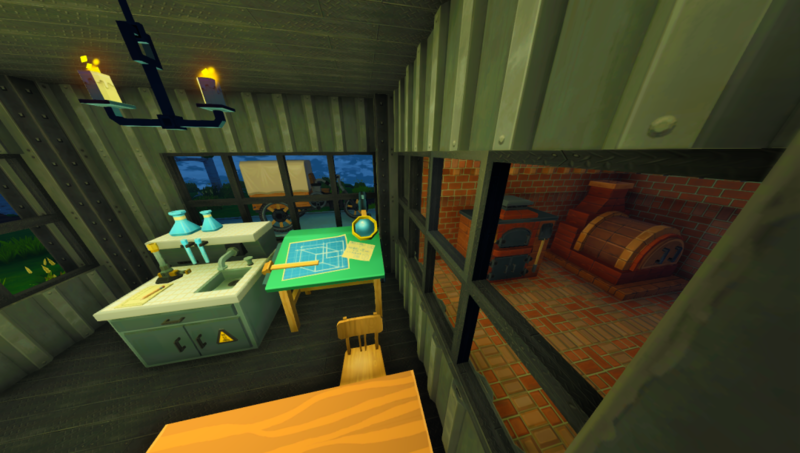 This will make building a lot more flexible - you can construct rooms however you want on your property, and place tables as you like, as long as they meet the restrictions. I think we’ll see a lot more interesting player constructions with this. Later we’ll be adding room-bonuses so that your craft tables will get boosts if you place it in a building with special properties. I’ve been working with Eric to fix up and update the base terrain in Eco, improving performance and the look. 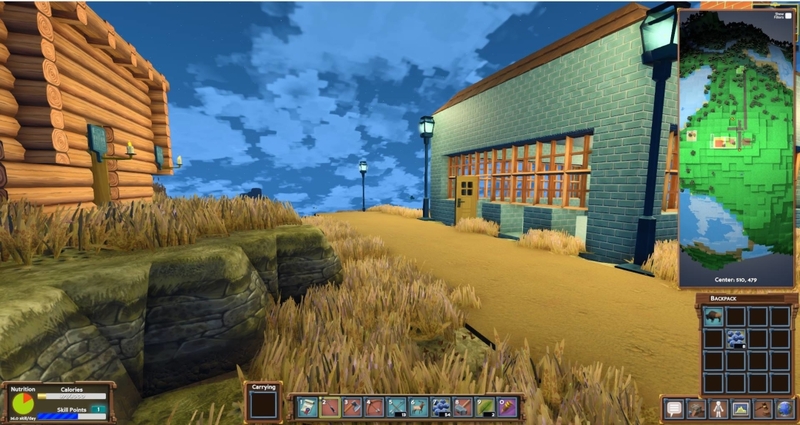 Eric improved custom builder tools and I reassembled all the pieces we use for grass/dirt/sand, and I’ve continued to iterate on the rock and ore’s custom builder geometry. We’re starting to approach the point where we can focus on authoring art rather than technology issues with the core terrain of Eco-- and as the next step I have been transitioning to working on buildings to get them to the same standard. Link to NoBlackThunder's local server guide. This week I participated in the 1776 Challenge Cup in Seattle (http://www.1776.vc/challenge-cup/), pitching our idea of Eco as a platform for both classrooms and entertainment, and we won! I’ll be going to San Francisco next week for the regional comp. Will post a video of the 2 minute pitch when it comes online. A big goal for Eco is to make it more than a game for entertainment, and getting the word out in these spheres outside the games industry will be a big part of that. Exciting to see others really believe in what we’re doing and the potential it has to transform education. Property will make a huge difference once our next system, Transport. Once you need to build expensive, resource consuming, polluting transport networks to move resources around the world, where you build something is going to make a huge difference and real estate will become valuable based on surrounding resources. Expect these systems in Alpha 4 and 5, which will have a huge impact on the game. Working on getting the new foliage actually in the game, and have it behave more realistically. For one, you no longer completely destroy most plants when harvesting - grass simply becomes cut, huckleberries just lose their berries. New UI for crafting table. Infinite dirt from dirt under finished construction. I’ve been continuing work on terrain, but also taking a break from that with updates to the tools and their animations. Starting work also on effects for tools and the world. Eventually all the craft tables will have in-use animations, and hopefully the tools will provide excellent feedback and satisfaction on use, with blocks in the world generating effects when you interact with them and when they are destroyed. Spent the week working out how we put together our in game foliage. Rebuilding the tree trunks, setting up their UV’s and working out the tree growth using morph targets. Currently working on growing foliage. Thanks all and email us directly with any comments/questions.